What Are The Most Dangerous Aspects Of Fall Driving? Fall is certainly one of the most beautiful of the seasons. As the temperature dips and the leaves start to change color, it can be easy to find yourself thinking about how much you love pumpkin spiced lattes or how awesome your Halloween costume is going to be, rather than concentrating on the road. In reality, fall can be a little tricky for drivers, the weather is changeable, the light conditions are getting darker and there are more children at the sides of the road. To help keep you and others safe, here are the top five most dangerous aspects of fall driving for you to consider. Fall is the time when children are going back to school after their summer holidays and, when combined with the lower light conditions, this means you should be taking extra care when driving through residential districts. Keep your speed low and check for children waiting for school buses and traveling to or from school. 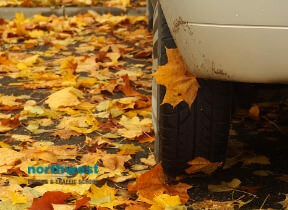 As the temperature drops, so will your tire pressure. Under-inflated tires are dangerous as they cause more friction with the road surface and increase the risk of you getting a sudden flat tire. A full set of under-inflated tires can also cost you money. Not only do they wear faster, and therefore need replacing sooner, but the increased friction is going to use up more gas, meaning you’ll be visiting the gas station more often. As summer transitions into fall, you might start to notice fog in the early mornings and the evenings. Alongside the obvious visibility concerns, the moisture in the fog can also make road surfaces slippery. When using your headlights, use low beams or fog lights. Your high beams will be reflected back by the fog and can actually decrease your visibility. If you need to use the road markings as a guide, follow the white lines on the right side on the road. If you start using the center line as your guide, you’ll naturally drift closer to the middle of the road and oncoming vehicles. While rain on its own isn’t a really dangerous situation, the first rains of fall that mix with the oil that has been burnt into the road surface all summer can result in a very slippery road surface. It doesn’t take long for the rain to wash that oil away, but it’s something to keep in mind. As winter approaches, you’ll start to see frost in the mornings. You’ll need to take precautions to make sure you can defrost your mirrors and get your car started and you’ll also need to drive a little slower and watch out for patches of black ice on corners and dips in the road. Keep this in mind when you are driving over a bridge in fall. Unlike the normal road surface, bridges have cold air flowing underneath them, increasing the likelihood of frost forming on their surfaces.